In the literary magazine De Nieuwe Gids of January 1893 Alphons Diepenbrock published a review of Le Latin mystique van Remy de Gourmont, which he had written on 13 December 1892.1 In response, Frans Erens wrote a critical article in the February edition,2 that included the Latin poem O Jesu ego amo te. The fact that Diepenbrock set this hymn to music within a month of its publication, is characteristic of the eagerness with which he absorbed religious poetry. Nevertheless, for the text of his Canticum Diepenbrock drew on a different, still unknown source. The text consists of four quatrains and one quintrain (strophe 4). The melody of the first quatrain reappears with more or less variation in the second, fourth and last strophe. This gives the composition the character of a hymn. Remarkably, in the intervening third strophe both the text and the music of the first two and a half lines are repeated. The expansive melody of this section, in which the first person speaks of the “innumeros dolores, sudores et angores et mortem” (innumerable pains, fears, cold and death) which Christ has undergone for us all, is in contrast with rest of the work. In a letter of a later date to Charles Smulders, Diepenbrock compared the text of Clair de lune (Moonlight, RC 43) with that of the Canticum. He wrote that this poem requires “une certaine monotonie par laquelle se traduit une langueur, ou bien une passion ardente et profonde mais contenue” (a certain monotony, through which a desire, or rather an ardent and deep – yet continuous – passion is conveyed). (BD III:81) Diepenbrock looked to achieve this through a simple melody with cornerstones on the tonic and dominant, as customary in Gregorian chant. Diepenbrock composed O Jesu ego amo te, which was completed on 13 March 1893, with the voice of Aaltje Reddingius (1868-1949) in mind and dedicated the work to her. He must have heard her sing in the Amsterdamsch a Cappela Choir of Daniël de Lange, of which she had been a member since 1891. In July 1893 she married the classicist and painter Michiel Noordewier (1868-1942) who was one of Diepenbrock’s acquaintances. Five years later, on 30 April 1898, the Canticum received its first performance at a concert in the Recital Hall of the Amsterdam Concertgebouw by Aaltje Noordewier-Reddingius and Anton Tierie. They also premiered six more songs by Diepenbrock (see RC 20, 23, 37, 40, 41 and 42). Diepenbrock wrote on the autograph A-41(3) “Cantiones mysticae (III. )”, thus indicating the religious-mystical relationship between this Canticum and the earlier Ave Maria (RC 23) and Jesu dulcis memoria (RC 24). Unlike the two other works, O Jesu ego amo te most likely started off with piano accompaniment. 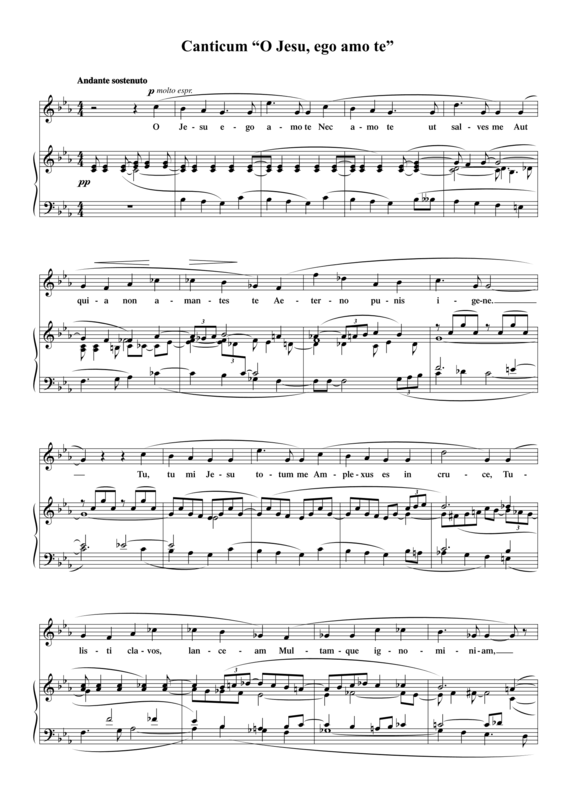 The version with organ accompaniment dates from 1916, when Diepenbrock rewrote the composition for a concert in the New Lutheran Church or Koepelkerk in Amsterdam by Aaltje Noordewier-Reddingius and Anton Tierie on 19 November 1916. In the organ part the four-part structure is carried through more consistently and several rhythmically repeated chords are replaced by sustained notes. On 16 May 1920, when Leonie Molkenboer, a daughter of his friend Theo Molkenboer, who was a painter, graphic designer and designer (1871-1920), entered the Benedictine Order, having given up her ambitions of becoming a singer, Diepenbrock presented her with a copy of the Canticum. However, this manuscript, described by Reeser in MHD (1933), has been lost. 1 Alphons Diepenbrock, ‘Remy de Gourmont: Le Latin Mystique’, in De Nieuwe Gids 8/2 (January, 1893), 263-274. See VG, 46-54. 2 Frans Erens, ‘Le Latin Mystique’, in De Nieuwe Gids 8/3 (February, 1893), 422-424. 3 Melchior von Diepenbrock, Geistlicher Blumenstrauss aus christlichen Dichter-Gärten, den Freunden heiliger Poesie (Sulzbach: Geidel 1862), 226. 4 John Julian (ed. ), A Dictionary of Hymnology Vol. I, A to O, (Dover: New York 1957 = reprint of 1907 2nd edition), 921ff. Et solum quia Deus es. 30 apr 1898 Eerste uitvoering van Ik ben in eenzaamheid niet meer alleen (RC 41), Écoutez la chanson bien douce (RC 40), Die Liebende schreibt (RC 20), Hinüber wall' ich (RC 37), Lied der Spinnerin (RC 42), Ave Maria (RC 23) en Canticum “O Jesu ego amo te” (RC 29) door Aaltje Noordewier-Reddingius met begeleiding van Anton Tierie tijdens een soiree in de Kleine Zaal van het Concertgebouw te Amsterdam, waarbij Josephine Royaards-Spoor gedichten van Willem Kloos, H.J. Boeken, Bredero en Vondel voordraagt. Over de beteekenis van de dichtwerken mag ik, als musicus, het zwijgen bewaren; trouwens er kwamen onder de voorgedragen geen voor over wier meer of minder sympathiewekkende eigenschappen men niet reeds een geruimen tijd een gevoelen heeft hooren uitspreken. Men mag daarom m.i. gerust het zwaartepunt van dezen avond zoeken in het muzikale gedeelte. De compositiën van Diepenbrock toch zijn zoo goed als geheel en al onbekend. Wel is de mis voor mannenstemmen en orgel in druk verschenen, wel zijn de Reijen voor v. d. Vondel's Gysbrecht van Aemstel Woensdag ll. uitgevoerd, wel werd ook het Stabat mater ten gehoore gebracht, maar zelfs deze werken zijn daardoor nog niet als bekend te beschouwen. En van de liederen voor een stem zijn, met uitzondering van een paar uit vroeger tijden, geen in druk verschenen en ook niet in 't openbaar ten gehoore gebracht. Men kan dus zeggen, dat wij in Diepenbrock een nieuwe verschijning mogen begroeten. Maar niet alleen omdat zijne werken nog weinig bekend zijn, moet men Diepenbrock een nieuwe verschijning noemen; neen, ook de wijze, waarop hij der tonen kunst beoefent, mag men als op zichzelf staande beschouwen. Wij hebben dus met een nieuwe verschijning, in den absoluten zin van het woord, te doen.